This article is a short summary of Fire Emblem Awakening. 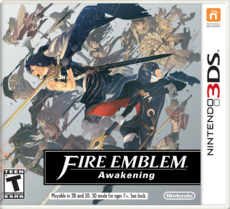 Fire Emblem Awakening, alternatively rendered Fire Emblem: Awakening, is the eleventh original installment in the Fire Emblem series. Developed to be the final entry in the series, the game was released for Nintendo 3DS in 2012 in Japan, and in 2013 worldwide. As an inevitable war draws ever closer, you must stand with Chrom and his forces--knights, mages, archers, and more--commanding them against the armies of kingdoms, empires, and the dead themselves. Move your troops on the battlefield, then choose their weapons and attack. Support your attacks with the help of nearby allies, and watch their skills and relationships grow. Plan your attack, customize your forces, and guide your heroes as you forge alliances that strengthen your resolve in battle and shape the course of history. Lead a team of distinct characters with unique abilities, rich backstories, and evolving relationships that guide the path of your quest. Plan your attack carefully – the lives of your soldiers and the future of the world depends on it. At the beginning of the game, the player (represented by an avatar character) is fighting alongside a man named Chrom against a mysterious enemy. However, after he is defeated the avatar stabs and kills Chrom. The avatar then wakes up in a field, having been found by Chrom and members of his army, the Shepherds. When they introduce themselves, the avatar shows no memory of their past. However, they and the Shepherds help save a nearby town from bandits from the nation of Plegia. As the group travels from the town, they encounter another threat arrives in the form of undead soldiers. However, as they are fighting, a masked warrior going by the name "Marth" arrives to assist them, but takes off immediately afterward. The group must now work to fight off both the undead warriors and attackers from Plegia. The gameplay of Fire Emblem Awakening is similar to past installments, but takes many features from past installments while also introducing new gameplay features to facilitate new players. Returning from the previous game is the addition of a customizable avatar unit. Also returning is the ability to select from one of two modes of play (separate from the difficulty settings): "Classic Mode", the traditional Fire Emblem gameplay, or "Casual Mode", in which units that are defeated do not permanently die and are instead unable to be used for the remainder of the battle. During battle, the player must strategically move their units across the grid-based map to defeat the enemy. However, if either the avatar or Chrom are defeated, then the player automatically receives a game over. Units can either move on their own, or the player can team them up using "Pair Up", an expansion upon the support mechanics in previous games in which one unit joins with another and moves as a single unit. The secondary unit supports the main one by giving them stat boosts during enemy encounters, and may occasionally "Dual Strike", attacking alongside them, or "Dual Guard", which blocks an oncoming attack. This also serves to raise the units' support level. Fire Emblem Awakening uses a stage-based structure and features a world map that can be traveled across between missions. From here, the player can purchase or sell items at shops, and play extra, non-essential "Paralogue" missions. Shopkeepers may also appear, which have rarer and more valuable items than the normal shops, and Risen may also appear for the player to battle in Challenge missions. Through StreetPass, another player's team will appear on the map, and through here the player can purchase items they have, view their stats, battle the team, recruit the leader, or dismiss them. From the menu, the player can access the Barracks, in which players can view conversations between units (which happen based on the system's internal clock) and can give them random rewards, download bonus content using the system's wireless features, set up a StreetPass team, and engage in Double Duel, in which two players team up to fight computer opponents. A demo for Fire Emblem Awakening was released on the Nintendo eShop before the game's international releases, on January 19, 2013, in North America, and in Europe on March 19. The demo requires 1024 blocks to download. The North American demo can only be played 30 times, while the European version has only ten plays. When starting the demo, the player can choose between all three default difficulties, but can only play the game in Casual Mode. Players are also only able to select a male avatar, and cannot customize their appearance or voice. The demo features the Prologue and Chapter 1. Champions Pack: features Champions of Yore 1, Champions of Yore 2, and Champions of Yore 3; the missions use maps from previous games, and center around characters from across the series. Lost Bloodlines Pack: features Lost Bloodlines 1, Lost Bloodlines 2, and Lost Bloodlines 3; the missions center around the player aiding or trying to defeat Marth or Seliph. Smash Brethren Pack: features Smash Brethren 1, Smash Brethren 2, and Smash Brethren 3; in these missions the player must fight with or against Roy and Ike. Rouges & Redeemers Pack: features Rouges & Redeemers 1, Rouges & Redeemers 2, and Rouges & Redeemers 3; In these missions the player must defeat either the "hero of light" and the "hero of darkness"
Golden Pack: features Golden Gaffe, EXPonential Growth, and Infinite Regalia; the missions focus on giving the player experience, money, and items and weapons. Scramble Pack: features Harvest Scramble, Summer Scramble, and Hot-Spring Scramble; the missions are not meant to provide much challenge. Challenge Pack: features Death's Embrace, Five-Anna Firefight, and Roster Rescue; the missions are meant to provide a challenge to the player. The Future Past Pack: features The Future Past 1, The Future Past 2, and The Future Past 3; the missions focus on the child units in an alternate, ruined future. Apotheois: a single mission meant to be more difficult than the others. Fire Emblem Awakening Nintendo 3DS (Happy Price Selection) JP: September 15, 2016 A re-release of the game under the Happy Price Selection line in Japan. The Legend of Zelda: Ocarina of Time 3D • Fire Emblem Awakening Double Pack Nintendo 3DS JP: January 1, 2018 A two-pack bundle that includes re-releases of the Happy Price Selection releases of both Fire Emblem Awakening and The Legend of Zelda: Ocarina of Time 3D.